1. You can earn money selling the items you no longer want or need. 2. By recognizing that every new purchase will take up space, you will buy less. 3. When you realize that you are not defined by what you own, and are no longer keeping up with the Joneses, you will make more informed purchases based on quality rather than brand name labels. 4. You will take better care of the few things you do own, so they will last longer and you won’t need to buy replacements so quickly. 5. Minimalism is about removing excess and focusing on what really matters. You will find that people and experiences matter more than acquiring things, this will be reflected in your spending habits. 6. You will save money on rent or mortgage if you relocate to a smaller home or apartment. 7. If you downsize to a smaller place, it will result in lower utility bills. 8. You may save money on car insurance and gas if you downsize to a smaller, more fuel-efficient vehicle. 9. You will spend less time cleaning and maintaining your home and belongings. This time could be spent on activities such as knitting, sewing, gardening or cooking, saving you money on food and clothing costs. 10. 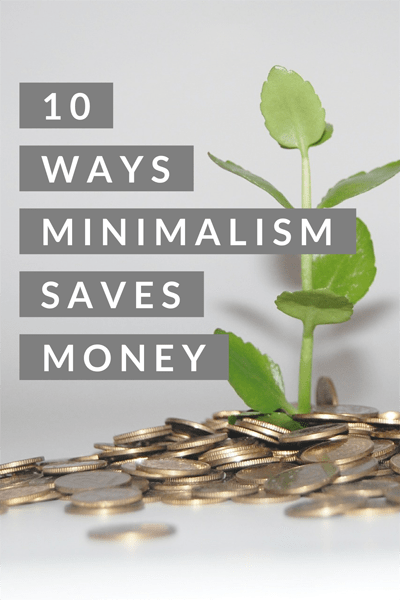 As a minimalist, buying less means you will spend less money overall, if that money is used to pay down debt faster, you will save on debt interest charges and other fees. If you’re ready to move toward a minimalist lifestyle and would like guidance and assistance in sorting through your belongings, I’d love to speak with you. I am available for in-person organizing services in the Raleigh, North Carolina area, and I offer virtual organizing services elsewhere. To learn more, please contact me for a free consultation call.